Engineered for Ease of Use, Versatility and Outstanding Value, Zebra's most affordable industrial ZT200 Series Printers incorporate extensive customer feedback and learnings from legacy printers, creating innovative printers with a space-saving design. 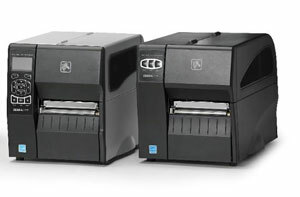 Whether you are adopting barcode technology for the first time or upgrading existing your existing printers, the ZT200 Series is the right choice for a variety of labeling applications. These innovative printers provide many user benefits, and they are ENERGY STAR qualified to save you money throughout their lifecycle. 4.09" Industrial Printer, Tear Bar, 203 dpi, 6 ips, USB, Serial, Direct Thermal. 4.09" Industrial Printer, Tear Bar, 203 dpi, 6 ips, Ethernet, USB, Serial, Direct Thermal. 4.09" Industrial Printer, Tear Bar, 300 dpi, 6 ips, USB, Serial, Direct Thermal. 4.09" Industrial Printer, Tear Bar, 300 dpi, 6 ips, Ethernet, USB, Serial, Direct Thermal. 4.09" Industrial Printer, Tear Bar, 203 dpi, 6 ips, USB, Serial, Thermal Transfer. 4.09" Industrial Printer, Tear Bar, 203 dpi, 6 ips, Ethernet, USB, Serial, Thermal Transfer. 4.09" Industrial Printer, Tear Bar, 300 dpi, 6 ips, USB, Serial, Thermal Transfer. 4.09" Industrial Printer, Tear Bar, 300 dpi, 6 ips, Ethernet, USB, Serial, Thermal Transfer. 4.09" Industrial Printer, Tear Bar, 203 dpi, 6 ips, USB, Serial, Parallel, Direct Thermal. 4.09" Industrial Printer, Peel, 203 dpi, 6 ips, USB, Serial, Direct Thermal. 4.09" Industrial Printer, Peel w/ Liner Take-Up, 203 dpi, 6 ips, USB, Serial, Direct Thermal. 4.09" Industrial Printer, Peel, 203 dpi, 6 ips, Ethernet, USB, Serial, Direct Thermal. 4.09" Industrial Printer, Cutter, 203 dpi, 6 ips, USB, Serial, Direct Thermal. 4.09" Industrial Printer, Tear Bar, 203 dpi, 6 ips, USB, Serial, 802.11 N, Direct Thermal. 4.09" Industrial Printer, Peel, 203 dpi, 6 ips, USB, Serial, 802.11 N, Direct Thermal. 4.09" Industrial Printer, Peel w/ Liner Take-Up, 203 dpi, 6 ips, Ethernet, USB, Serial, Direct Thermal. 4.09" Industrial Printer, Cutter, 203 dpi, 6 ips, Ethernet, USB, Serial, Direct Thermal. 4.09" Industrial Printer, Peel w/ Liner Take-Up, 203 dpi, 6 ips, USB, Serial, 802.11 N, Direct Thermal. 4.09" Industrial Printer, Tear Bar, 300 dpi, 6 ips, USB, Serial, Parallel, Direct Thermal. 4.09" Industrial Printer, Peel, 300 dpi, 6 ips, USB, Serial, Direct Thermal. 4.09" Industrial Printer, Peel, 300 dpi, 6 ips, Ethernet, USB, Serial, Direct Thermal. 4.09" Industrial Printer, Tear Bar, 300 dpi, 6 ips, USB, Serial, 802.11 N, Direct Thermal. 4.09" Industrial Printer, Peel w/ Liner Take-Up, 300 dpi, 6 ips, Ethernet, USB, Serial, Direct Thermal. 4.09" Industrial Printer, Cutter, 300 dpi, 6 ips, Ethernet, USB, Serial, Direct Thermal. 4.09" Industrial Printer, Tear Bar, 203 dpi, 6 ips, USB, Serial, Parallel, Thermal Transfer. 4.09" Industrial Printer, Tear Bar, 203 dpi, 6 ips, USB, Serial, 802.11 N, Thermal Transfer. 4.09" Industrial Printer, Peel, 203 dpi, 6 ips, USB, Serial, Thermal Transfer. 4.09" Industrial Printer, Peel, 203 dpi, 6 ips, USB, Serial, Parallel, Thermal Transfer. 4.09" Industrial Printer, Peel, 203 dpi, 6 ips, Ethernet, USB, Serial, Thermal Transfer. 4.09" Industrial Printer, Peel, 203 dpi, 6 ips, USB, Serial, 802.11 N, Thermal Transfer. 4.09" Industrial Printer, Peel w/ Liner Take-Up, 203 dpi, 6 ips, USB, Serial, Thermal Transfer. 4.09" Industrial Printer, Peel w/ Liner Take-Up, 203 dpi, 6 ips, USB, Serial, Parallel, Thermal Transfer. 4.09" Industrial Printer, Peel w/ Liner Take-Up, 203 dpi, 6 ips, Ethernet, USB, Serial, Thermal Transfer. 4.09" Industrial Printer, Peel w/ Liner Take-Up, 203 dpi, 6 ips, USB, Serial, 802.11 N, Thermal Transfer. 4.09" Industrial Printer, Cutter, 203 dpi, 6 ips, USB, Serial, Thermal Transfer. 4.09" Industrial Printer, Cutter, 203 dpi, 6 ips, USB, Serial, Parallel, Thermal Transfer. 4.09" Industrial Printer, Cutter, 203 dpi, 6 ips, Ethernet, USB, Serial, Thermal Transfer. 4.09" Industrial Printer, Cutter, 203 dpi, 6 ips, USB, Serial, 802.11 N, Thermal Transfer. 4.09" Industrial Printer, Tear Bar, 300 dpi, 6 ips, USB, Serial, Parallel, Thermal Transfer. 4.09" Industrial Printer, Tear Bar, 300 dpi, 6 ips, USB, Serial, 802.11 N, Thermal Transfer. 4.09" Industrial Printer, Peel, 300 dpi, 6 ips, USB, Serial, Thermal Transfer. 4.09" Industrial Printer, Peel, 300 dpi, 6 ips, USB, Serial, Parallel, Thermal Transfer. 4.09" Industrial Printer, Peel, 300 dpi, 6 ips, Ethernet, USB, Serial, Thermal Transfer. 4.09" Industrial Printer, Peel w/ Liner Take-Up, 300 dpi, 6 ips, USB, Serial, Thermal Transfer. 4.09" Industrial Printer, Peel w/ Liner Take-Up, 300 dpi, 6 ips, USB, Serial, Parallel, Thermal Transfer. 4.09" Industrial Printer, Peel w/ Liner Take-Up, 300 dpi, 6 ips, Ethernet, USB, Serial, Thermal Transfer. 4.09" Industrial Printer, Peel w/ Liner Take-Up, 300 dpi, 6 ips, USB, Serial, 802.11 N, Thermal Transfer. 4.09" Industrial Printer, Cutter, 300 dpi, 6 ips, USB, Serial, Thermal Transfer. 4.09" Industrial Printer, Cutter, 300 dpi, 6 ips, USB, Serial, Parallel, Thermal Transfer. 4.09" Industrial Printer, Cutter, 300 dpi, 6 ips, Ethernet, USB, Serial, Thermal Transfer. 4.09" Industrial Printer, Cutter, 300 dpi, 6 ips, USB, Serial, 802.11 N, Thermal Transfer.